I am Mike Diggins and I am the chief mechanic and business owner of Classic BRENT AUTOS (former Brent Autos est.1989), an independent and specialist garage, which I founded in 1989 and which is based in Willesden from where I have been serving clients especially from the surrounding areas such as Kensal Rise, Kensal Green, Kilburn, Brondesbury, Cricklewood and all over North West London. I have over 30 years’ experience in the automotive industry and offer expert diagnostics, mechanical repair, servicing and MOT services for both modern day and classic cars. I also have a particular wealth of knowledge of French makes and models, such as Renault, Citroen and Peugeot, however have experience of servicing most types and makes of vehicles. I am Birgit Diggins. 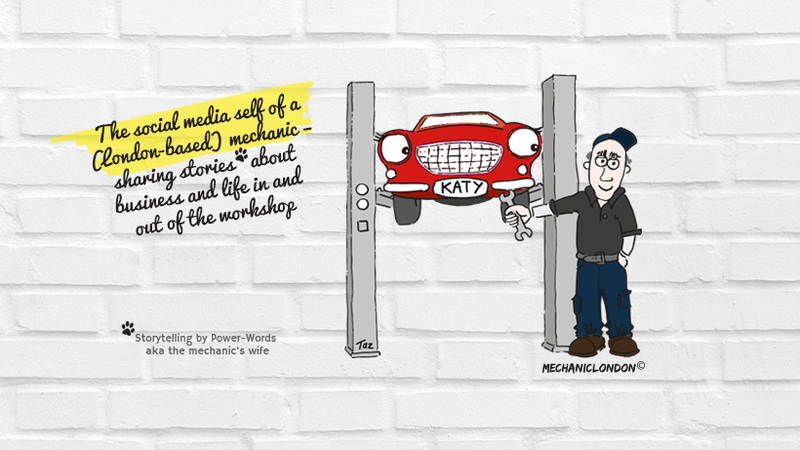 I am the motor mechanic’s wife and mechaniclondon storyteller. Helping out in the garage with marketing and admin work really got my entrepreneurial taste buds going and in 2012 got me to ditch my 15 year corporate career to join forces with the husband and also to start my own small business ‘Power-Words’, a content marketing consultancy where I help clients design strategic plans and also write their copy for their web and marketing content.